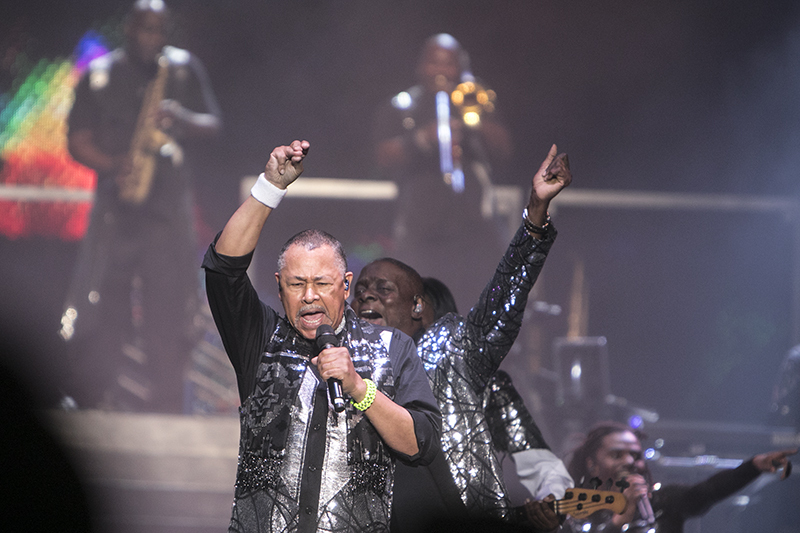 The entire experience of seeing legendary R&B, soul, funk, disco band Earth, Wind and Fire (EWF) can really be summed up in a single sentence: Earth, Wind and Fire knows how to put on a show. All the elements of a killer live set were there- superb visual aesthetics, above and beyond showmanship, a range of vocal powerhouses, choreographed dance moves, a legendary horn section, and a slew of hits that everyone with ears has danced to for nearly four decades. Their 2054 The Tour is a co-headlining double feature with Chic ft. Nile Rodgers, which launched its North American tour with a stop at the Oakland Coliseum. 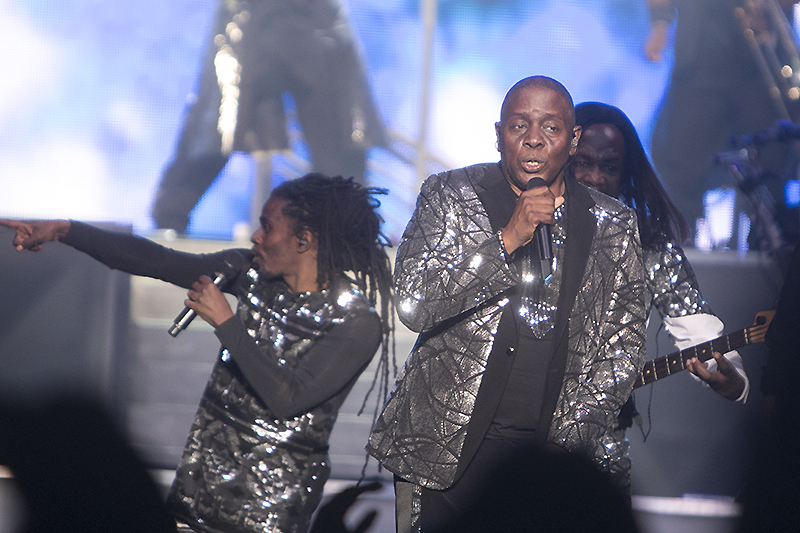 While there were several elements that were a nod to the tour’s futuristic theme, including silver costumes, space age graphics and a mini movie that kicked off the show, the crowd was transported back in time with hit after hit from EWF’s extensive catalogue of chart toppers from the 70s and early 80s. From the moment they came out on stage in a tightly choreographed entrance, it was clear this was a fully thought out show. The three-tiered pyramid stage allowed for the numerous members of the band to be separately featured. At the top of the pyramid, EWF’s legendary brass section, composed of Gary Bias on sax, Bobby Burns, Jr. on trumpet, and Reggie Young on trombone, brought the funk and kept the entertainment value high with lively dance moves. The middle section was anchored by John Paris on drums and bandleader Myron McKinley on the keys. 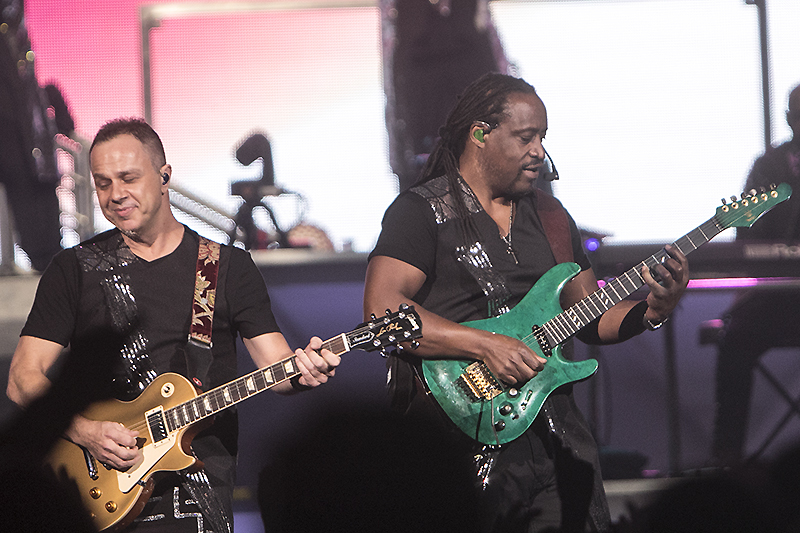 This is the band’s first tour since the death of founder and lead singer Maurice White, but founding member and vocalist Philip Bailey’s presence was large enough to overcome any sense of absence. 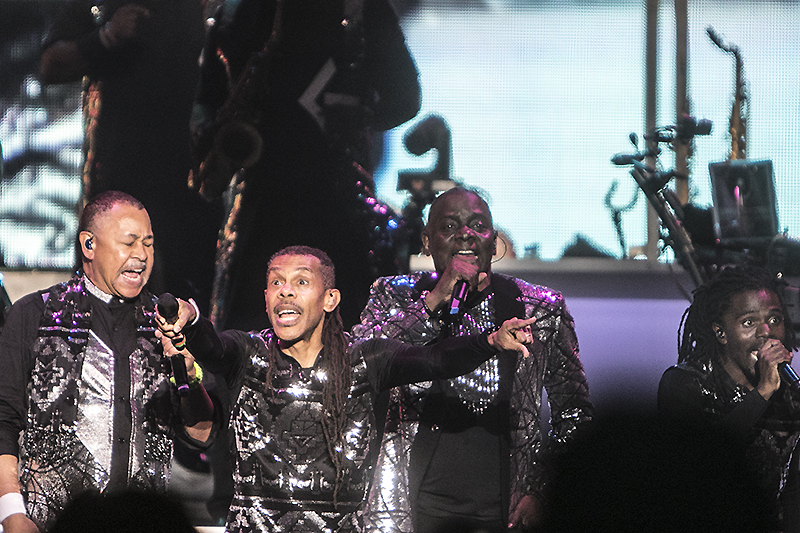 Vocally, the band benefits from the absurdly enormous range of Bailey, backed by the depth of background vocalists B. David Whitworth and Bailey’s son, Philip Bailey, Jr.. Original member Ralph Johnson also seamlessly moves between duties holding down the percussion section and lead vocals. The best of EWF is when all four vocalists are singing together. Their depth and attention to perfect harmony makes it sound as if you’re listening to the radio rather than to live voices. 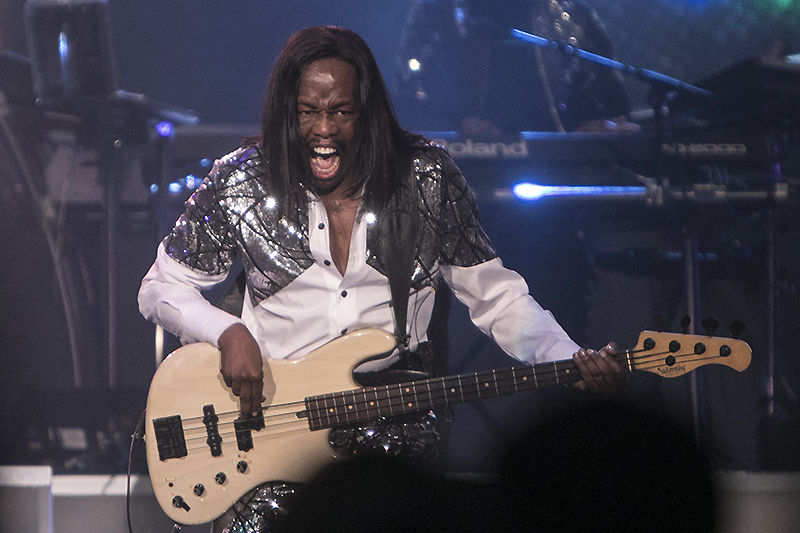 All three of the original members, Bailey, Johnson and bassist Verdine White were featured heavily throughout the evening. The band would not be anywhere nearly as funky as it is without the incredible baselines from White. He is a talented musician as well as a true showman. The evening got started with Chic feat. 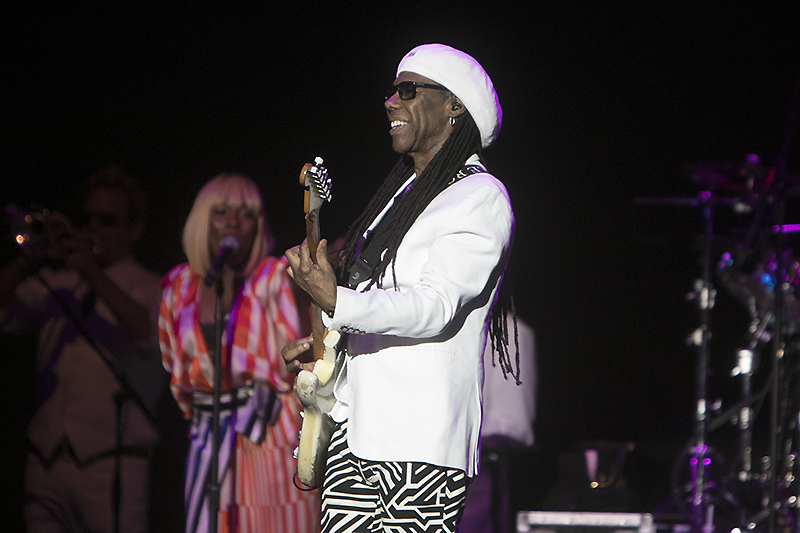 Nile Rodgers rolling out the hits. Rodgers was inducted into the Rock and Roll Hall of Fame this year after being inducted into the Songwriters Hall of Fame in 2016. As Rodgers himself said, he has enough material to do an entire set of chart-topping songs, which they delivered with an energetic mix of disco, funk and R&B classics. 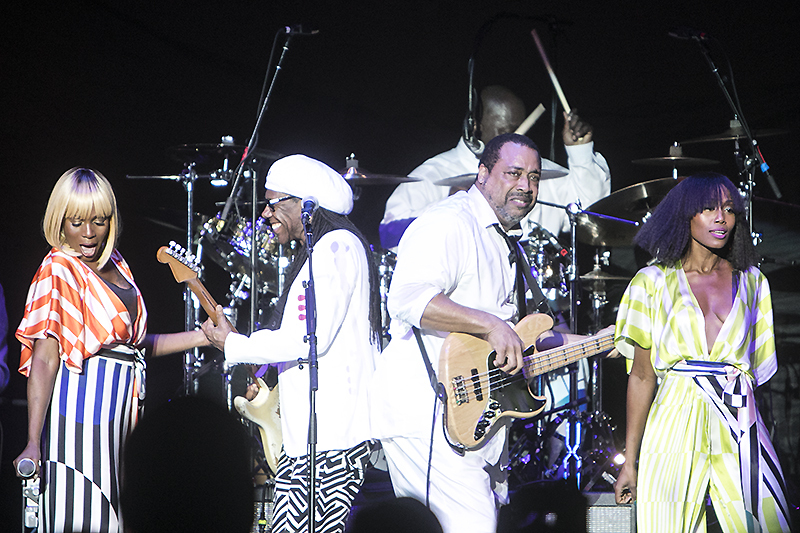 Chic opened with their disco era hit “Everybody Dance,” which certainly had the intended effect. Backed by two incredible vocalists Kimberly Davis and Folami Ankoanda, the band then moved into a medley of number one singles Rodgers wrote and produced for other artists. Davis launched straight into two Diana Ross classics, “Coming Out” and “Upside Down.” The medley ended with the ubiquitous classic, “We Are Family,” made famous by Sister Sledge. 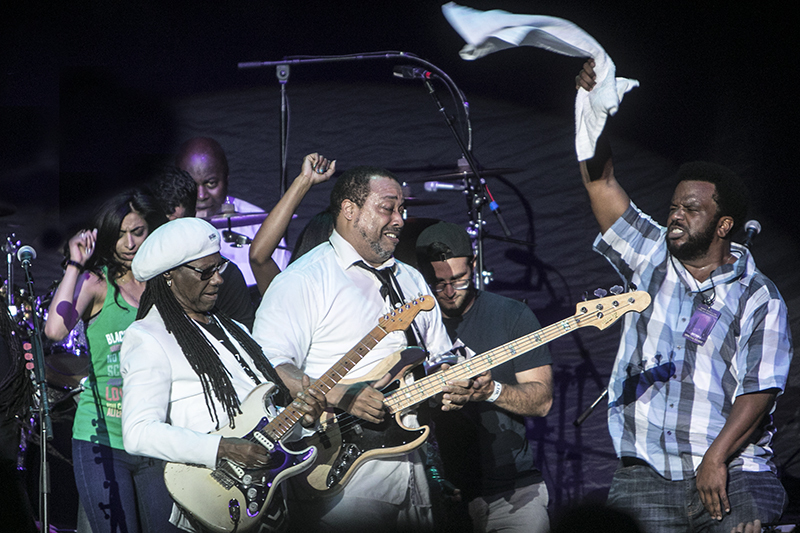 Truly, Nile Rodgers is a hit machine, and it was a phenomenal way to kick off the evening and get the crowd on their feet. At one point during the set, Rodgers slowed things down to share a personal story of being diagnosed with cancer six years ago, with doctors estimating he had just months to live. While still on the road to recovery, he got together with Pharrell Williams and Daft Punk to write “Get Lucky,” which Davis sang acapella before the band put its signature funk on the track. “Get Lucky” was inescapable in 2013, so it was surprising to learn the deeply personal back story about its inspiration. 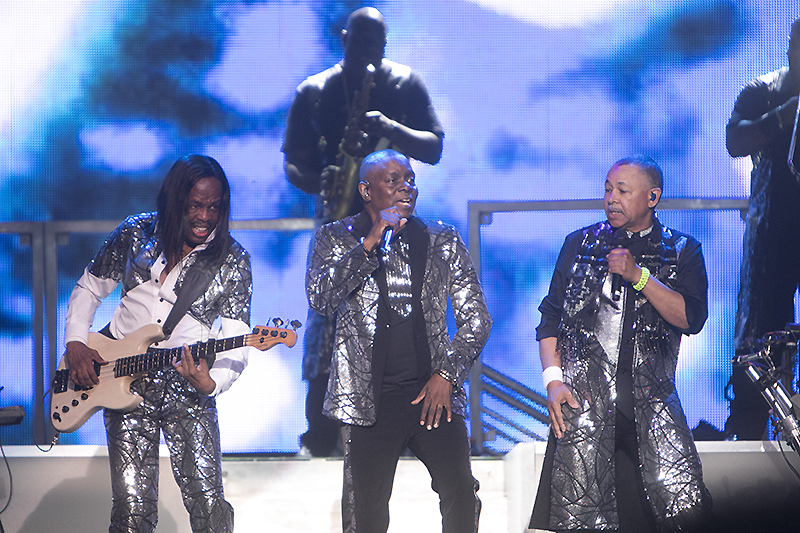 For more information about Earth, Wind and Fire, see their website. 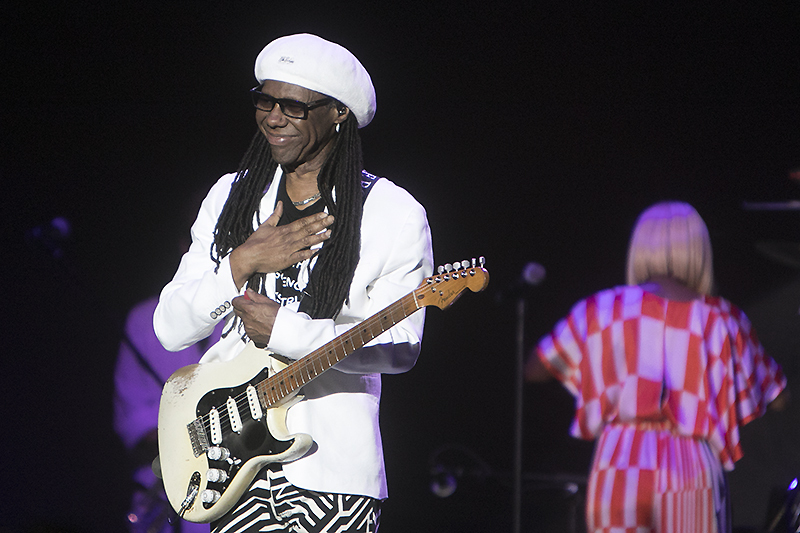 Find out more about Chic ft. Nile Rodgers here.